The first time President John F. Kennedy visited NASA’s headquarters, he met a janitor mopping the floor. President Kennedy asked him what he was doing. "I’m helping to put a man on the moon", the janitor replied. While the anecdote is certainly credit to NASA's leadership, it gives an even better example of followership. Leaders must be able to light the flame. But followers keep the flame alive. During our lives, we experience many different kinds of hierarchy. From our first experiences in our family to our nursery years, school days, friendships and sports teams, our early experiences prepare us for adulthood and its diverse hierarchical structures. Within such structures, we face different kinds of formal and informal leadership. Whether our experiences are good or bad, we learn powerful lessons. Our most enduring experience of leadership is not in our professional environment, but in our social lives. Here, informal but nevertheless powerful - and sometimes difficult - exchanges of leadership take place. Examples include family structures, circles of friends and even the dynamic between a pet and its owner. In many cases, leadership and followership roles alternate over time. Leadership is a constant exchange between leader and follower. It is both verbal and non-verbal. The strength of the relationship depends on each party’s capacity to support the other. Being a good leader involves knowing one’s own strengths and weaknesses. It requires being able to listen and follow a subordinate, should their unique expertise afford them a temporary leadership role. A new leader must resonate with both those above and below them. They have to fit into a complex architecture of formal and informal leadership, while also performing in their own field. 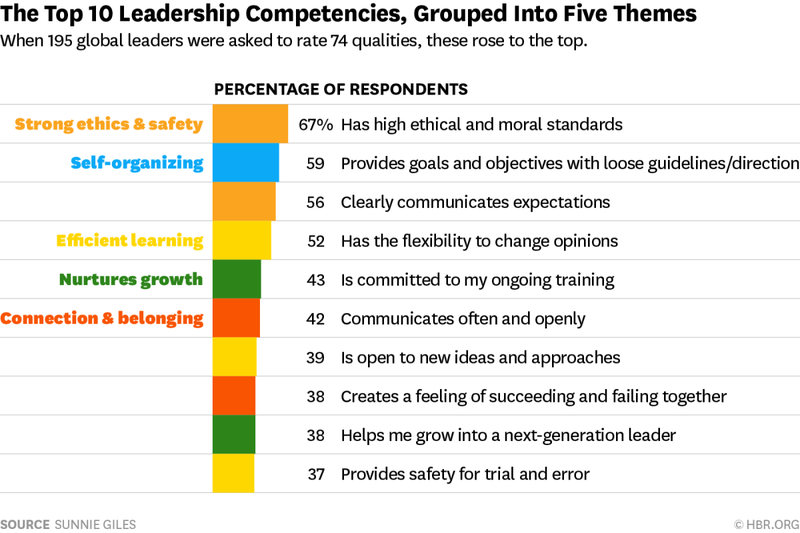 The following charts give an overview of what both followers and leaders consider the most important leadership attributes. Followers expect leaders to be exemplary personalities with charisma, empathy and social skills. Leaders say leadership involves giving clear directions, aiming for success, and developing and motivating a team. The ideal leader should fulfil both followers’ and leaders’ expectations. Creating a profile to attract such leaders is a two-fold task. First, how can we assess experienced leaders against these criteria? Second, how can we identify those with strong leadership potential, but who, for one reason or another, have never fulfilled it. In every organization, there may be outstanding leader personalities that have never believed themselves to be so, or who have never had the opportunity to realize their potential. Go and find them! Character is a key ingredient for creating long-lasting positive synergy between a leader and their team. Positive synergy is the ability to optimize a team's strengths and skills, generating a powerful joint effort in a shared direction. The leader’s character should combine all the soft skills that enable the emotional dynamic in a leadership exchange. In the figure above, followers expressed a clear opinion about an ideal leader’s attributes. These include integrity, empathy, communication skills, humility, authenticity, strength and determination. I believe that the ultimate attribute of a leader is the capacity to listen, to understand and to feel the needs, fears and expectations of every team member. Without this, there is no reciprocal trust, and it is not possible to bring a team together for success. A leader with a powerful cocktail of empathy, emotional intelligence and strong values is more likely to be followed than an intellectual hotshot who is unable to find a common language with their team. In terms of potential, a leader's creativity and their readiness to explore uncharted territory is paramount. A leader looks for an answer without being asked. They identify the right question, and choose the path their team should follow to seek the answer. Creativity is a state of mind. It depends largely on the capacity for self-motivation. It is the backbone of a proactive and solution-oriented leadership. A natural born leader is full of ideas, suggestions and solutions. In order to find the right questions to ask, a leader needs expertise on the topic, so as to be able to address the unknown parts of a specific problem. They also need expertise in leading the process, enabling their team to participate in the solution, rather than be overwhelmed by the problem. Expertise is indispensable in a good leader, but it will support and enhance leadership only if combined with other attributes. The force multiplier for creativity is logical thinking. There is no value in having great visions and ideas if they are too abstract to be implemented. Logical thinking makes ideas consistent and structured, so that they can be understood and carried by the team. Logical thinking simplifies a concept as far as possible, facilitating understanding without losing the bigger picture. A leader must be ready, willing and able to leave their comfort zone. They must be ready for new challenges; be able to self-motivate without any external input; be ready for self-assessment; and be able to have their approaches challenged. A leader practices self-discipline. They take a positive, can-do attitude towards everything they do. "If you want to change the world, start off by making your bed", former commander of the United States Special Operations Command Admiral William H. McRaven (USN) said during the University of Texas at Austin’s 2014 commencement address. A leader’s day starts early in the morning, with small actions such as making their own bed or going out jogging despite poor weather conditions. They begin with simple, easy wins. Individually, such actions may seem irrelevant. But when done consistently, they give a clear picture of the person. There is no contradiction between creativity and self-discipline. Self-discipline means being organized in managing one’s daily routine without losing time in thinking about it. Self-discipline helps organize one’s day, and organizing one’s day helps find time to think and be creative. Simple things like being punctual and having a healthy, clean and well-groomed appearance are signs of a respectful and self-respecting attitude. As a follower, it is easier to respect and follow somebody who respects themself. It requires sensitivity to integrate into an existing framework of relationships. Assuming a leadership role in an organization means creating constructive relationships with superiors and subordinates. Especially in a complex environment which depends on dynamic and fast-reacting processes, the compatibility of newly appointed leaders with the organization’s identity and human capital will play a decisive role. Good manners, kindness and care are valuable attributes. They help avoid, contain or reduce potential friction. Passion provides the emotion in a leadership exchange. Showing passion exponentially raises a team’s potential, enhances the power of its can-do attitude and increases its resilience. Passion is the poetry of leadership. As a poet writes to people's hearts, a leader speaks to their subordinates’ hearts. While searching for a great leader, look for a person who can do this. Any leadership exchange involving that person will see exponential results. Leadership is not about individuals. Once a new leader is found, leading the organization remains a shared responsibility within the entire community of its leaders, as well as between leaders and followers. Every leader shares the responsibility to lead consistently, at their respective level, and according to their organization’s values and principles. Success depends on how an organization defines its core principles of leadership. It must select leaders who have an adequate level of innovation and independent personality, but who can also understand and implement the organization's principles. When you define your leadership values, everything seems possible.